Pilates conditions the body from head to toe, improving core stability, strength with flexibility, posture, balance, and body awareness. It is designed to work for everybody regardless of age or condition. It’s great for pre and post-natal care to prepare for birth, and restore the body after the birth. It can help seniors improve balance and posture, strengthen muscles and prevent bone deterioration. Pilates is also a good option for athletes seeking rehabilitation after injury or surgery or to help enhance performance. Understanding that you are unique and new to our studio and/or Pilates we would like to find out as much as we can about you and what you are looking for. Every new client is recommended to book an initial consultation where we will discuss your needs and goals, take you through the basics of Pilates and design a program suitable to you. To get started please complete our Initial Consultation Questionnaire. In Private Sessions, you get to work one-on-one with an instructor on an individual program specifically designed to meet your needs and goals. Duet sessions are shared with one other person, and trio sessions are shared with an additional two individuals. These three classes offer varying degrees of personal attention, depending on your skill and preference. If you prefer a group Pilates experience, we offer Group Reformer Classes, with a maximum of 5 people per class. 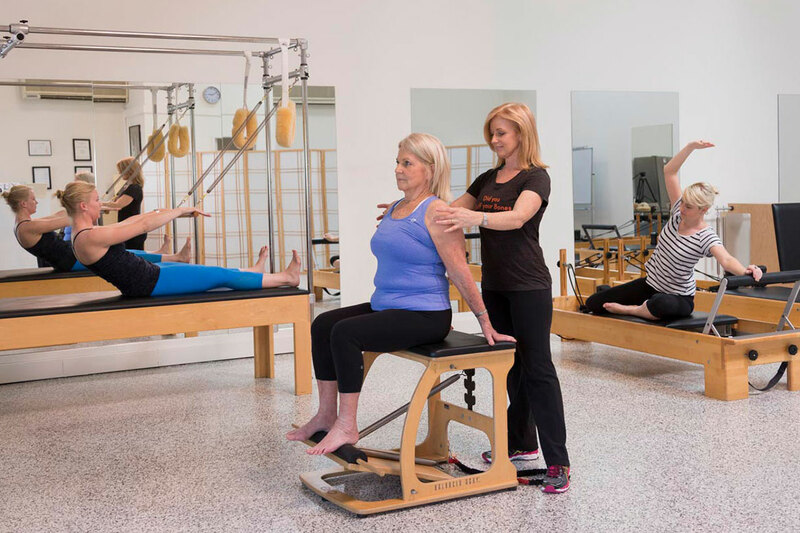 A Pilates Matwork class will rely on small props but no major equipment, with no more than 8 people per class. These classes are great for when you already have a handle on the basic moves and don’t need specialised attention. CORE PILATES BRISBANE offers Corporate Programs. Your business can enjoy a special rate for classes held at the studio. You also have an option to have a teacher sent to your workplace. Buff Bones® is a medically-endorsed workout that combines Pilates, functional movement, strength training, and therapeutic exercise with bone-strengthening and balance techniques to optimise the health and safety of your bones. The workout follows a research-supported design of specifically sequenced exercises, making it an entire system of bone and joint health. Toning your arms, hips, back and abs, the Buff Bones® system also improves posture, is adaptable to varying levels, and is even safe for those with Osteoporosis. If you are unsure of your goals and just want to give Pilates a try, then this is a good starting place for you. Ideal for most students who come to Pilates with a relatively heathy and able body. If you are committed to change, then this is the perfect place for you to start. Ideal for most students who come to Pilates with a relatively heathy and able body. This package is designed for students with special requirements, such as returning from illness or injury, or specific performance training. These sessions are conducted by our Senior Trainers. "About eight months ago, I realised I couldn’t move my right arm with full range, and also felt a bit of pain from it. I thought it was caused by not enough exercise so I added yoga and swimming to my regular workout routine. However, things weren’t getting better. As I worked out harder, and more often, I started feeling a pain in my left leg (around the pelvic area) and couldn’t stretch or move it like before. I had some physio treatments but only received temporary pain relief. I couldn’t sleep well with the pain and soon I started limping. I couldn’t understand what was wrong with my body. That’s when I started having sessions with Lisa at Core Pilates. I was told that I had muscle preferences (overusing some parts and never using others), which resulted in breaking the balance of the body, and causing the pain. Throughout the sessions, I've learnt the correct muscles to use for certain movements and how to develop the strength in muscles which I did not fully use before. More importantly, I am gaining more awareness of my own body and the way it moves. It's been about seven months since I started Pilates. Now I'm not afraid of walking down long shopping centre corridors any more as I can walk without limping and pain. My weekends are more exciting as I can go tracking to the mountains. I can sleep well without waking up in the middle of the night with pains in my leg. Most of all, it has changed my attitude towards things that I took for granted before. I feel thankful when I walk and stretch my arms without pain. I couldn’t have made it to this point without Lisa's guidance and encouragement. She has been very specific and confident with a big picture for me. It has made me feel secure and motivated to keep going. She makes every session inspiring and exciting with bright energy. She loves what she does and she does each session with her full heart. Thank you Lisa. I am so lucky to meet you and Pilates." "To me, Lisa is not a Pilates teacher, she is a body whisperer. She has rescued me from chronic pain through patient instruction and care. I had forgotten body awareness many years ago, and she has gradually helped me rediscover that I can improve my core strength and posture. I have been to countless physiotherapists, Pilates instructors, Yoga teachers, osteopaths and the like. None of them come close to Lisa in her ability to communicate how to extend what your body can do. Fun, kind and giving, I’ve watched her work with seemingly boundless energy and interest in every client who walks through her doors. She also handpicks the wonderful instructors in her studio, so there is continuity in her programs. Core Pilates and Lisa is sort of a best kept secret, but she deserves to be discovered far and wide!" "I just wanted to say thank you for settin g up such an awesome Pilates studio in Brisbane! I had a great class today; it ended up just being me so I got lots of attention. I was doing some stand-up calf exercises… and was looking out the window with a view of the city scape and Storey Bridge in the sunshine, and just had a moment of thinking…“I love living in Brisbane and my life feels pretty good right now”! So thank you for creating such a nurturing studio space for me to be a part of and to feel that feeling. So often we “rush” through our days and don’t get to appreciate those moments." "After I turned 31 I realised my body wasn’t bouncing back from daily stresses as quickly as it did in my 20s. I was working a desk job and had back and hip pain. I knew I needed to get moving to give myself a break from sitting all day and the odd neighbourhood walk just wasn’t cutting it anymore! I came to Core Pilates with absolutely no experience. I had done some casual yoga classes and some even more casual (and comical) dance classes in the past, but I was ready to get a little bit more serious about my health and wellbeing. My partner had started classes with Lisa and convinced me to come along. I’m so very glad I did! Lisa and her team are warm, welcoming and the most positive and encouraging people you’ll ever meet. They make the effort to get to know you; not only what your body is capable of and where it could use a little help, but also what you respond to in terms of communication and instruction. Having private sessions with Core Pilates means that I get the instruction I need to do my exercises correctly. I get personalised feedback for each movement. This helps me improve quicker than I would in a larger class situation. The movements themselves are not difficult to do; you build up to more complicated exercises as you gain more confidence. For anyone undecided about taking on Pilates I say do it! It really has been a great experience. I look forward to my sessions (and previously I had never looked forward to any form of exercise!) and I feel my body improving every week." "I am extremely grateful to Lisa and her team at Core Pilates. Originally I went because I sit all day in my office and had pain in my hips. This is no longer an issue. Additional benefits have been that I am much more flexible and my posture has greatly improved. Also, I am continually reminded how fortunate I have been to have such knowledgeable teachers when I see other people struggling to climb stairs or walk up hills or even step over an obstacle. I see what my life would be like without their knowledge, encouragement and care. Finally, a big result for me from Pilates is the vanity factor. I am in much better shape than I was two years ago. They are unfailingly kind, enthusiastic, encouraging and professional. Lisa’s knowledge and commitment is stunning. I am so glad I found this particular studio some years ago." "My wife has been going to Core Pilates for some time, and she was forever wanting me to come along. She would tell me how much better she felt, and she knew that my middle aged body would feel the benefits as well. So, eventually and probably a little reluctantly, I succumbed , and wow was I surprised, now I can, without hesitation say, that I feel somewhat transformed. Lisa and her team, are the consummate professionals , they know exactly what they are doing, and they do it perfectly. They are Brisbane’s best kept Pilates secret. Sssh, don’t tell anyone." "I started classes with Lisa at Core Pilates almost a year ago. Having never done it before I did a series of individual sessions so I could gain an understanding of the techniques and gain confidence in my own ability. In my very first class Lisa quickly assessed and recognised some issues with my body, such as restricted hamstrings due to a childhood illness and about 30 years of subsequently using my body incorrectly to compensate. Since that first class, every session I’ve had at Core Pilates has been designed specifically for my body in a clever combination of stretches and exercises that address these issues while continuing to build body strength. When I moved to group classes, I was surprised that each student was being instructed by Lisa in their own individual program as having done yoga intermittently in the past, I assumed everyone would be following the same routine. I believe this personalised attention is what makes Core Pilates an exceptional studio. I have learned so much about how the human body – my body – is designed to move, and I just love Lisa’s little cues and descriptions to help me visualise and understand both the movements I’m aiming to achieve and how my body is working to do them. The studio in Spring Hill is filled with natural light and is spacious enough for lots of equipment and room for mat work. There is always a welcoming and uplifting mood in the studio. I think the varied ages, body shapes and backgrounds of both the students and instructors is testament to the fact that Core Pilates is not about “the body buffed and beautiful” scene like you find in many gyms and workout fads, but is a unique space where you can feel at home in your own body and amongst friends."